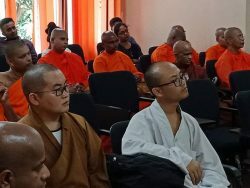 The Department of Buddhist Studies commenced a certificate course in Introduction to Buddhist Studies on 05th May 2018. 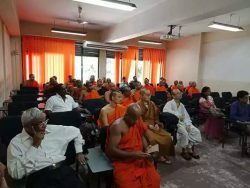 The course aims to provide a substantial knowledge of Buddhism in English through the Buddhist sources and to improve the students’ skills to translate Pali verses and process. The eminent scholars Prof. Oliver Abenayake, Prof. Ven. 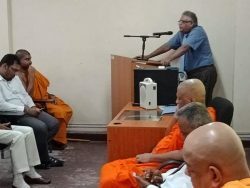 M. Dhammajothi (HoD Buddhist Studies) Prof. Premakumara De Silva (Dean – Faculty of Arts), Prof. Ven. W. Wimalarathana (HoD Economics), Prof. Lasantha Manawadu (HoD Geography) and Ms. Savithri Dias were present at the inauguration.